2 huge white magnetic hooks to be used on many magnetic surfaces: whiteboard, magnetic board, steel cabinet, etc. 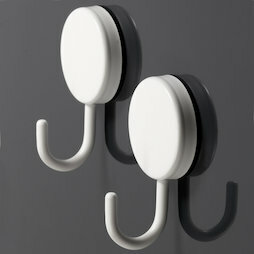 Thanks to the slip-resistant silicone surface the hooks can hold a lot without sliding down. Perfect for hanging up dish towels or kitchen utensils. 1 pc. 9,88 EUR ea. 1 pc. 9,80 EUR ea. 1 pc. 9,95 EUR ea. 1 pc. 13,45 EUR ea.